You will watch Pokemon Season 1 Episode 38 online for free episodes with high quality. 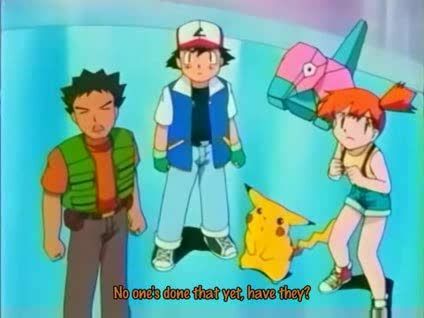 Online episode guide, Pokemon Season 1 Episode 38 Dennō Senshi Porigon Ash and his friends arrive at a chaotic Pokémon Center; Ash asks Nurse Joy what is wrong. She tells our heroes that the Pokéball transfer machine is having problems. The Pokémon she sends arrive at another Pokémon Center as a different Pokémon! Professor Akihabara, the inventor of the Pokémon Transport System, explains that some thieves have intruded on the system and are causing havoc. The professor then sends our heroes and his Porygon into the virtual world. Then, the gang realize that it is Team Rocket. Will the gang be able to help Nurse Joy and avoid getting deleted?